Enjoy the freedom of printing multiple sizes from 4” x 6” to 11” x 17”; all the way up to 13” x 19”. Streamline your productivity with exclusive downloadable solution templates. Help your business ideas get noticed with the PIXMA iX6820 Wireless Inkjet Business Printer. The PIXMA iX6820 is the ideal office printer, able to output everything from 4" x 6" mailers to 11" x 17" spreadsheets--even big 13" x 19" presentation charts. You'll be impressed by the quality. 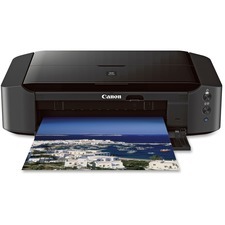 With 9600 x 2400 maximum color dpi, it delivers exceptional printing detail. With five individual ink tanks, you'll not only get amazing color, you can replace only the color that runs out. The PIXMA iX6820 helps to streamline your productivity with exclusive, downloadable Solution Templates. Say goodbye to the hassle of having to create every document from scratch. Maximum Print Speed (Black): 15 ppm; Network Ready: Yes; Printer Type: Inkjet; Print Resolution (Color) (Width x Height): 9600 x 2400 dpi.